Sew Can Do: Sewing With Laminated Cotton, Project Roundup & Fabric Giveaway! 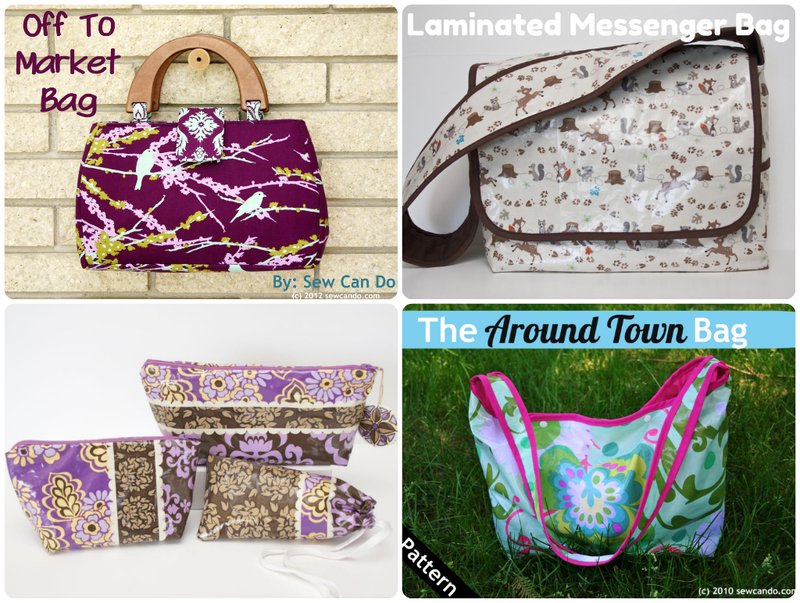 Sewing With Laminated Cotton, Project Roundup & Fabric Giveaway! What is laminated cotton? Cotton that's been coated on one side with a thin layer of laminate to render it water-resistant. Similar to oilcloth & basic iron-on vinyl, but unlike those stiff & sticky fabrics, it does not contain BPA or phthalates (aka bad-for-you chemicals that leach out of some plastics). This means it's safe for baby & kid's projects. And while it's soft like regular cotton, it's got more strength, durability & form. Unlike plain cotton which is usually 44 inches wide, many (but not all) laminated cotton is 54-56 inches wide. So can be a lot more fabric to use! It's a wipe clean fabric and usually can be washed, but it should be kept away from dryers & hot irons. 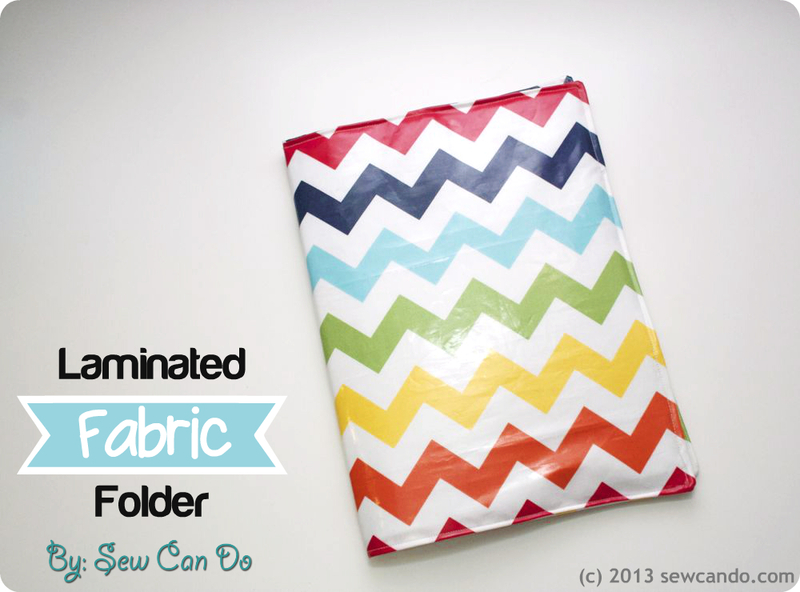 Keep fabric rolled when stored, folding it will leave creases that can be tough to get out. It can usually be ironed on the wrong side with a press cloth on the low or medium setting. The laminated side can stick under the presser foot & feed dogs when facing out, so add a drop of sewing machine oil under it or use tissue paper or lip balm to cover the right side fabric and then rip/wipe off when done. 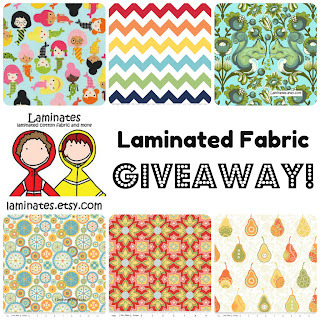 My lovely sponsor, Laminates, is a fabulous shop for finding loads of laminated cotton prints. 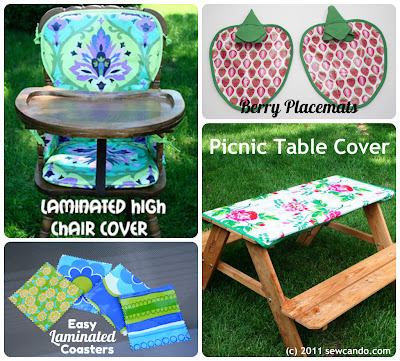 They also have great specialty patterns, laminate-friendly notions - even chalkboard fabric! Now how about trying for a $20 gift certificate so you can make your own laminated lovelies? The laminated Flutter Petals in red would be perfect to make a kitchen table cloth. I've never sewn with laminate. I like the around town bag .Thanks! Oh man! I have been dying to try laminate, so I'd love any of the laminates they carry. What a great giveaway! I have been wanting to make lunch boxes and snack bags for my 4 kids. I love the laminates for bids!!! Great giveaway! I made a kite bag out of laminates that can also be used as a mat for sitting on when the kites are in use. Easier to work with than I thought it would be. I like the lady bugs and owls. So cool - those Urban Whales would be great for boys. I love the colors on the Folklorico! I love the bird prints. Wow there are so many fun patterns to choose from and so many possibilities for projects! I'd love to win!! that's a really neat giveaway! would love to have a chance to work with laminated cotton! Folklorica is beautiful! thank you! I love the Girlfriends Mermaids and the Cows! 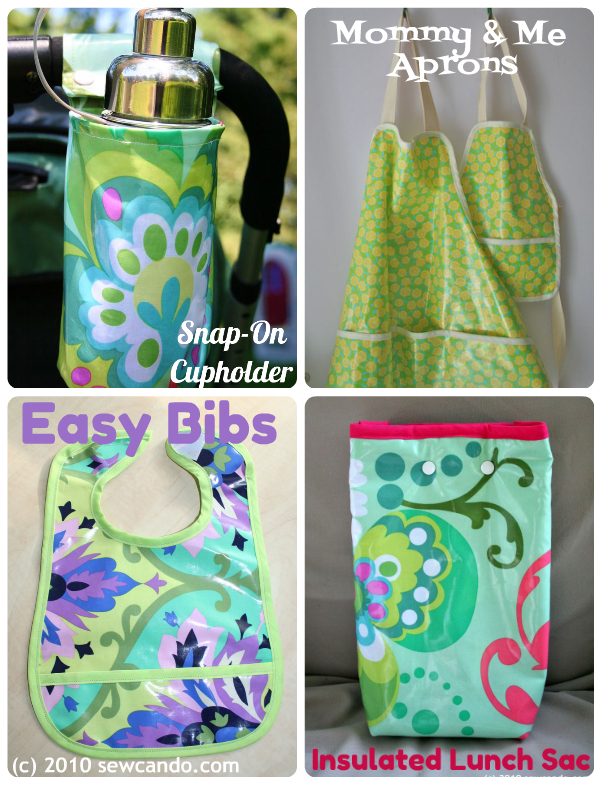 I've heard so many wonderful things about Wonder Clips - I'd like to give them a go!! I love all the chevrons, of course. I was just thinking of a few projects I needed to make that would require such awesome laminate cotton and then saw this giveaway. Seriously...I have to win! I love the boy chevron fabric. I love the Sweet Nothings to make a raincoat for my little girl!! Ooooh... love the chevrons (need these!) and the nesting dolls. I love the Rainbow Chevrons and the Urban birds!! So cute! I love the Rainbow chevron fabric! I love the monkey print - would be great for bibs for my new little guy arriving in May! I am liking the Marmalade Blueberry Dots fabric! So many possibilities with laminate fabrics. Thanks for a chance to win. The rainbow chevron pattern is awesome! I like the rainbow chevron too ! I am totally IN LOVE with these new laminates! My fav would be the cherries on black. Great fabrics. Can't wait to try them out. i love the orange laminated bicycles fabric! I love the Urban Birds. Like all the Chevrons too. monkeys... owls... birds...kumari garden... i could keep going! I've been eyeing the http://www.etsy.com/listing/125735225/maeve-periwinkle-laminated-cotton-fabric?ref=shop_home_active for days! I adore using laminates! 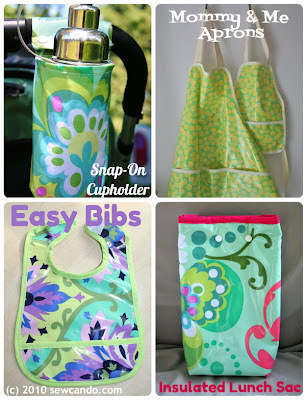 I have covered seat cushions, made bibs, aprons, and purses! It is such a fun fabric. The Folklorio fabric is wonderful, AND the wonder clips would be extremely useful as well. Love the Birds of Norway laminate! Lovely Giveaway! Thanks for the opportunity! I'd love to start sewing with laminates! This would be a great way to do that! Plink LAMINATED fabric Kaffe Fassett turquoise! Fun! Thanks for sharing this. I'm liking Brassica, but it's SO hard to choose! I love the Kumari Garden and the urban birds, and so many more! I like the RV pattern. i love the chevron fabric! Thanks for the chance to win. Just had a look at the fabrics - and I LOVE the monkeys!! Love the Bohemian Green Dots!!! I have just discovered this fabric and love it! I have made several bags with LC . . . it's such a great material! I like the pink chevron.